Having been founded in 1893, Genoa CFC holds the title of the oldest Italian football team. It was originally a cricket and athletic club; it wasn't until 1897 that the football section started dominating the club. This change is mostly credited to the work of an English doctor named James Richardson Spensley, otherwise known as the father of Italian football. In its early years Genoa was in fact an English club with the function of representing its country abroad. 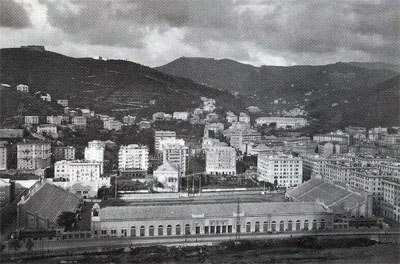 Old photograph of Stadio Luigi Ferraris. Genoa wasted no time in setting the football world ablaze, winning six out of the first seven Italian football championships ever organized (1898, 1899, 1900, 1902, 1903 and 1904). Their dominance came to an end with the rise of other contenders to the throne such as Juventus and Milan, and the club had to settle for playing second fiddle for the rest of the decade. The appointment of William Garbutt as head coach in 1912 brought a lot of positive changes to the club. As the first professional manager in the country, Garbutt led the club to its seventh title in 1915; however, Genoa would only be awarded the title four years later, after the World War I had ended. Even though many of their players died while on military duty, Genoa stayed in the top of Italian football. With Garbutt still the team manager, the club won its final two championships in 1922 and 1924 (a few years before the league change its name to Serie A). These two titles marked the beginning of the end for the club's ambitions; after winning its first and only Coppa Italia trophy in 1937, the best part of Genoa's next seven decades were steeped in mediocrity. Genoa's final stab at relevance came in 1991. The club managed to reach the UEFA Cup semi-finals, narrowly losing to eventual winners Ajax. What followed was their darkest period – in 1995 they were relegated to Serie B, which was to be their home for the next ten years. In 2005, they were demoted to Serie C1 due to their part in the match-fixing scandal. Not long after that, however, Genoa earned their promotion to Serie A, where they're still competing to this day. The upper part of the Genoa crest consists of the English flag, this is due to fact that the club in its early years represented England abroad. The main part of the crest is divided by the red and blue colors and a drawing of a griffin (a mythic creature) in the foreground.